It’s January, which means it’s already time for the merchandising market to start salivating over the next Marvel movie, Captain America: Civil War. Kicking of the proceedings in the battle for whether or not Team Cap or Team Iron Man gets to rummage through your wallet and make your earnings disappear is Bandai! The Japanese company have unveiled first looks at their new Captain America and Iron Man toys that will release as part of their Civil War line, which will eventually include all the members of each side of the conflict—Scarlet Witch, Sharon Carter, Falcon, Hawkeye, Winter Soldier, and Ant-Man on Team Steve Rogers, and Vision, Black Widow, War Machine, and Black Panther on Team Tony Stark. The only look at Iron Man’s new suit comes in the above splash image on Bandai’s Tamashii Nations wesbite, but the Captain America figure has been revealed in all its glory. The roughly 6” tall articulated figure of Cap in his Age of Ultron/Civil War-style supersuit will come with his trusty shield, sets of alternate hands to pose him as either throwing said shield or ready to punch someone, and, pretty niftily, an alternate unmasked head of Steve. While it’s not the perfect Chris Evans, it’s not all that bad—especially considering that whenever Hasbro have done unmasked Cap figures before they’ve tended to skew more to looking like the comic book cap rather than the live-action version. It’s a pretty decent attempt for Bandai’s first take on doing a Steve Rogers sculpt. 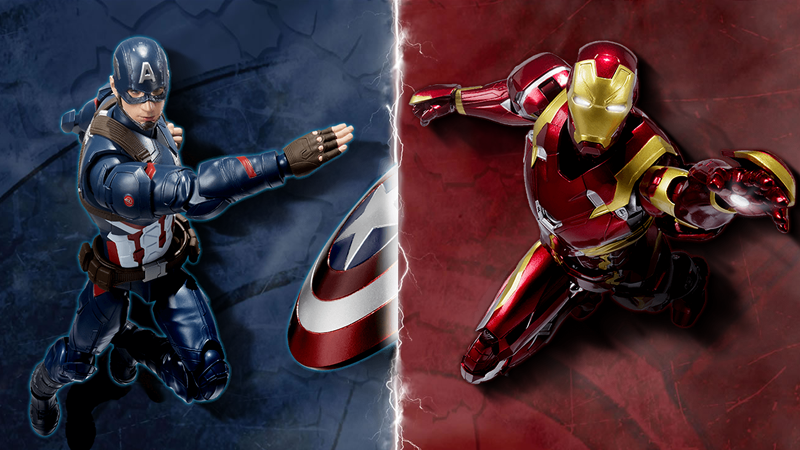 The Civil War Captain America Figuarts releases in Japan this May, for the price of 5,800 Yen—that’s around $50 USD.